AMB for combination windows B_ _. 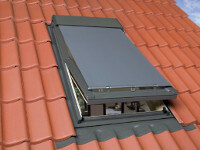 The awning blind provides optimum protection from overheating while, at the same time providing a view to the outside. Fakro awning blind reflects sun rays before they reach the glass and thus protects against heat build-up on sunny days, providing relief for the eyes and protection from the harmful effects of strong reflected light, which is especially important when working with computers. 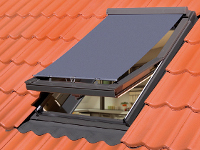 The awning blind AMZ is made of durable, weather- resistant fibre glass fabric. The fabric is roller mounted, spring loaded and fitted inside an aluminium casing which is installed at the top of the window. This enables easy control of the blind and makes it possible to use a wider fabric, thus providing additional protection against ingress of light. To control the blind an 80cm long rod is supplied in package. There is also available a rod ZSZ which is 150 cm long. AMZ manually operated or with the use of rod (supplied in package). AMZ NewLine have a new cartridge, significantly improving the aesthetics of the awning blinds - a flat cassette much closer integrated into the window design. There are two versions of manual awnings blinds in Fakro offer. 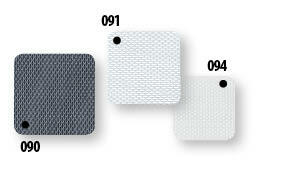 Fabrics used in awning blinds AMZ NewLine are the same as in the current AMZ. AMZ - Effective shading of the room whilst still allowing some light in.